Warner has gone back and released the first four Harry Potter films in 4K UHD Blu-ray, and, unfortunately, Harry Potter and the Sorcerer’s Stone is not up to par in the video department as the other seven films. Run Time: 2 Hr. 32 Min. When it was announced that JK Rowling’s popular novel, Harry Potter and the Sorcerer’s Stone, would be made into a movie, the filmmakers were challenged to remain faithful to the book as to not alienate it’s very young fanbase. This meant trying to cram as many small moments from the very long novel into an acceptable running time for a family film. In many ways, that ultimately worked against them as critics complained that the movie was overly-long, running two and a half hours. I tend to agree with them on that point, especially as this is the lightest and possibly weakest of the Harry Potter novels. It is also the sweetest, with the three leads at their most innocent. If you are not familiar with the story, you likely have been living under a rock for the last 20 years. Some of the film’s strengths come in its casting (nearly every character has been perfectly cast), the gorgeous production design, and, of course, John Williams’ memorable score. The movie may not have been a home run with critics and those who had not read the books, it did set up the franchise that would improve with each additional film. Harry Potter and the Sorcerer’s Stone was shot on 35mm film stock with digital effects created at 2K resolution, eventually outputted as a 35mm interpositive. It is assumed that Warner Bros scanned that interpositive of the original theatrical cut at 4K resolution to create this 2160p transfer enhanced with HDR10 high dynamic range. While a definite improvement over the now-dated VC-1 encoded 1080p transfer created for the Blu-ray that was first released way back in 2007, this film has always had a problematic transfer, which is a bit more confounded when it comes to the application of HDR. Details are improved, particularly in textures of the intricate stone walls of the sets and fabrics used in the costumes. The overall color tone is much warmer than before, with deeper yellows and oranges, while metallic and crystal-like items have a more defined shine and translucency. Where the transfer (and HDR) falters is in contrast, with blacks often appearing grey with some loss of shadow detail and whites sometimes appearing washed out along with flesh tones. As I said, it is an improvement over the 1080p Blu-ray, but someone really overdid the HDR processing on this release. 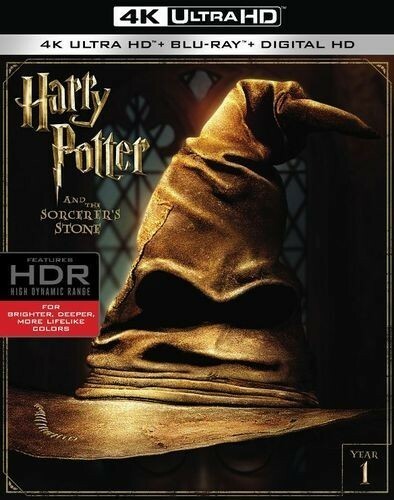 Harry Potter and the Sorcerer’s Stone gets an upgraded DTS-X soundtrack, providing more depth to the overall sound design with more precise placement of sound cues and added height channels, providing more natural panning of effects from one end of the listening area to another. LFE presence is a bit stronger, while dialogue is clear and understandable throughout without getting drowned out by music and effects. Introduction by Daniel Radcliffe (1080i; 1:54): Radcliffe speaks very quickly, apparently from the set of Deathly Hallows, about what viewers can expect to see in this eight-part series that spans over all eight films. Creating the World of Harry Potter Part 1 – The Magic Begins (1080i; 62:47): A rather comprehensive look at the book phenomenon, developing the movie, casting, and fan reaction to the first film. A Glimpse Into the World of Harry Potter (480i; 9:15): More of an EPK piece, this is the 2001 International TV Special. Deleted Scenes (1080p; 9:36): A total of seven scenes, viewable as a whole or individually – Dudley’s New School Uniform, Petunia Cracks Eggs With Letters Inside, Tube Ride, Kids Leave Girls’ Bathroom, Harry Sits By Fire In Great Hall, Harry Finds Nicolas Flamel Card, and Snape Classroom (Extended). TV Spots (480i; 7:46): A total of 15 commercials. This one seems to be out-of-stock at Amazon. I wonder if something is up with that because of what you stated in your review. I love this release, now the best of the series in terms of natural looking grain. It may have more to do with the fact that some were shipped in the wrong cases, using a standard 2-disc UHD case (causing one disc to be a floater) rather than the 2-spindle multi-disc cases Warner has used in the past (and on the other three Harry Potter films). I wish they could have finally included the Philosopher's and Sorcercer's Stone editions in the same package for once! Just watched HP 1, been a LONG time since I have seen that. Call me not impressed with the PQ, I mean I have seen several older films in UHD that look much better. I am going to get and rewatch them all in UHD, but I was expecting more unless it is just the way it was shot. While the film may not match the other Potter films in video quality, the UHD does constitute an advance over the Blu-ray which was really soft in lots of shots. Here, the clarity reveals the less than stellar CG effects as they related to the creatures (a victim of the era; CG has come SO far since then). I just got this today and watched it this evening. I don't plan to buy the entire series on UHD (I prefer the final two in the 3D versions I now have), but bought the first two since they were shot on film and Goblet of Fire since it's my favorite of the series. Some will probably see this as an extreme nit-pick, but did they still change the Warner Bros opening on this? The Blu-Ray in the "Hogwarts Collection" has an updated version with the "A TimeWarner Company" byline; the original release, and still on the DVD included in that set, says in all caps "AN AOL TIME WARNER COMPANY". That's an alteration in my book. I have both the US and Canadian versions on DVD and HD-DVD, and the Blu-Ray set I have is from Canada and so has the Philosopher's title. So, this version is the theatrical cut, and not the (slightly) extended cut? Same with the digital copy. Theatrical UHD. Extended HD as an extra. The UHD has "An AOL Time Warner Company". That's good to know, I might buy the UHD separate, and the rest if they're good enough but don't want the last one in 2D. They changed intro might've also been a result of the extended version, which would've been OK if they had only put it on that version. Haven't checked the rest of the movies in the Blu-Ray set yet. Are you sure this was scanned from an InterPositive and not the negative?